TH E M R EP O RT | 21 FEATURE generations. Because of this, they often skip the "starter home" phase and search for a slightly larger and pricier home. Across the nation, they pay a median price of $217,000 for their homes, and their median home size is 1,800 square feet. And if you think that young homebuyers only want to live in big cities, think again. Only about 25 percent of them live in urban areas, with nearly 50 percent preferring to buy in suburban communities. Finally, keep in mind that mil - lennials often have different mort- gage preferences than previous generations. For many of them, student debt is a financial burden that prevents them from saving for a down payment. A 2016 study by Citizens Bank found that millenni- als with student debt are spending, on average, one-fifth of their sala- ries on paying their student loans. Moreover, 57 percent of millennials say they regret taking on as much student debt as they did. 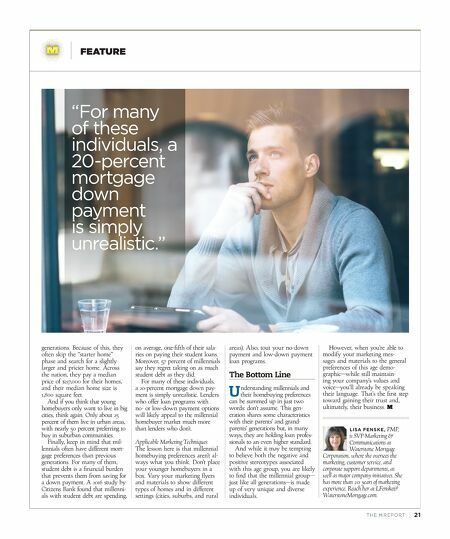 For many of these individuals, a 20-percent mortgage down pay- ment is simply unrealistic. Lenders who offer loan programs with no- or low-down payment options will likely appeal to the millennial homebuyer market much more than lenders who don't. Applicable Marketing Techniques: The lesson here is that millennial homebuying preferences aren't al - ways what you think. Don't place your younger homebuyers in a box. Vary your marketing flyers and materials to show different types of homes and in different settings (cities, suburbs, and rural areas). Also, tout your no-down payment and low-down payment loan programs. The Bottom Line U nderstanding millennials and their homebuying preferences can be summed up in just two words: don't assume. 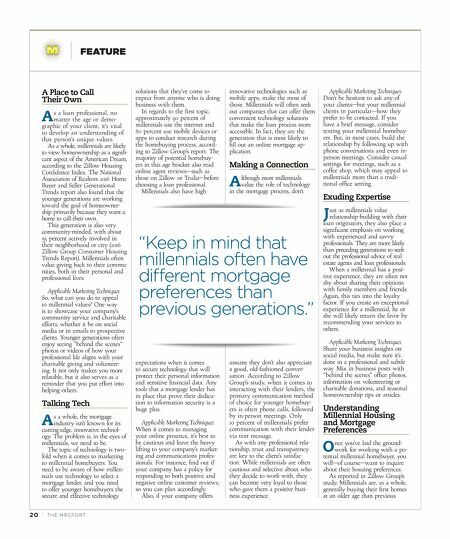 This gen- eration shares some characteristics with their parents' and grand- parents' generations but, in many ways, they are holding loan profes- sionals to an even higher standard. And while it may be tempting to believe both the negative and positive stereotypes associated with this age group, you are likely to find that the millennial group— just like all generations—is made up of very unique and diverse individuals. However, when you're able to modify your marketing mes - sages and materials to the general preferences of this age demo- graphic—while still maintain- ing your company's values and voice—you'll already be speaking their language. That's the first step toward gaining their trust and, ultimately, their business. LISA FENSKE , PMP, is SVP-Marketing & Communications at Waterstone Mortgage Corporation, where she oversees the marketing, customer service, and corporate support departments, as well as major company initiatives. She has more than 20 years of marketing experience. Reach her at LFenske@ WaterstoneMortgage.com. "For many of these individuals, a 20-percent mortgage down payment is simply unrealistic."